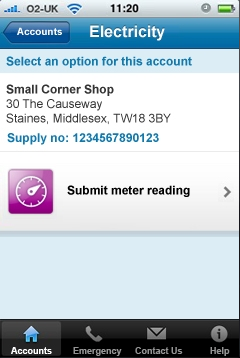 British Gas launch version 2 of their iPhone app – nice but non-inclusive! British Gas announced recently that they had updated their iPhone app to version 2. The original application, which was downloaded over 100,000 times, helped customers monitor energy use and submit meter readings to avoid estimated bills. In June alone over 18,000 meter readings were submitted using the app. More customers already contact us over the web than by telephone and with these new features, we expect that our App will quickly become the main way that many of our iPhone customers will manage their British Gas account. When I read this I wondered why, if more people are contacting British Gas over the web than by phone, they decided to develop an application for the iPhone. Why not a mobile site which works across all devices. I reached out to their spokesperson David Outhwaite and I asked him if there were plans to develop a similar app for competing platforms like Android or better yet a mobile website which would work across all platforms. 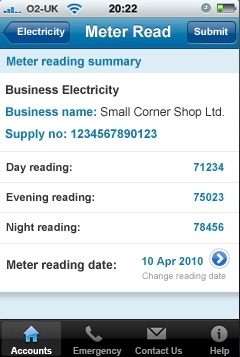 The fact that this application has been so successful for British Gas shows that people have an appetite for interacting with their energy related information. Consequently, I found David’s response very disappointing. Although I do own an iPhone, and I like what British Gas are doing with this app, I feel they are doing their non-iPhone owning customers a huge disservice by not providing them with similar functionality. Especially when you consider that the iPhone OS only commands 14% of the mobile operating system market share, what about the other 86% of British Gas’ customers? It wouldn’t be hard to develop a mobile site which served iPhones, Android devices, and other smartphones equally well. Hopefully British Gas will have a change of heart and produce a more inclusive mobile site soon.